According to the ECB’s Bank Lending Survey for October banks eased their credit standards in the last quarter, while their risk perceptions increased. This apparent contradiction suggests that the 137 banks surveyed were at the margin competing for lower-quality business, hardly the sign of a healthy lending market. Furthermore, the detail showed enterprises were cutting borrowing for fixed investment sharply and required more working capital instead to finance inventories and perhaps to cover trading losses. This survey follows bank lending statistics since the banking crisis to mid-2014, which are shown in the chart below (Source: ECB). It is likely that some of the contraction in bank lending has been replaced with bond finance by the larger credit-worthy corporations, and Eurozone banks have also preferred buying sovereign bonds. Meanwhile, the Eurozone economy obviously faces a deepening crisis. There are some global systemically important banks (G-SIBs) based in the Eurozone, and this week the Financial Stability Board (FSB) published a consultation document on G-SIBs’ capital ratios in connection with the bail-in procedures to be considered at the G20 meeting this weekend. The timing is not helpful for the ECB, because the FSB’s principle recommendation is that G-SIBs’ Tier 1 and 2 capital should as a minimum be double the Basel III level. This gives operational leverage of between 5 and 6.25 times risk-weighted assets, compared with up to 12.5 times under Basel III. The FSB expects the required capital increase to be satisfied mostly by the issue of qualifying debt instruments, so the G-SIBs will not have to tap equity markets. However, since Eurozone G-SIBs are faced with issuing bonds at higher interest rates than the returns on sovereign debt, they will be tempted to scale back their balance sheets instead. Meanwhile bank depositors should note they are no longer at the head of the creditors’ queue when their bank goes bust, which could affect the non-G-SIB banks with higher capital ratios. If G-SIBs can be de-geared without triggering a bank lending crisis the world of finance should eventually be a safer place: that’s the intention. Unfortunately, a bail-in of a large bank is unlikely to work in practice, because if an important bank does go to the wall, without the limitless government backing of a bail-out, money-markets will almost certainly fail to function in its wake and the crisis could rapidly become systemic. Meanwhile, it might appear that the ECB is a powerless bystander watching a train-wreck in the making. 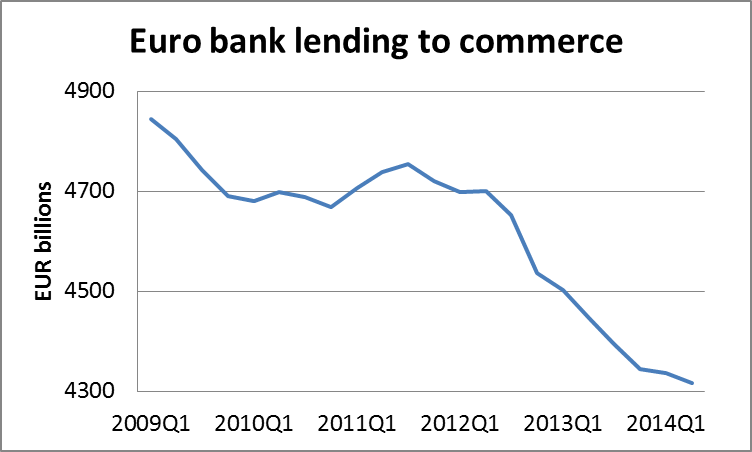 Businesses in the Eurozone appear to only want to borrow to survive, as we can see from the October Bank Lending Survey. Key banks are now being told to halve their balance sheet gearing, encouraging a further reduction in bank credit. Normally a central bank would respond by increasing the quantity of narrow money, which the ECB is trying to do despite the legal hurdles in its founding constitution. However, it is becoming apparent that the ECB’s intention to increase its balance sheet by up to €1 trillion may not be nearly enough, given that the FSB’s proposals look like giving an added spin to contraction of bank credit in the Eurozone. Take two banks which engage in the same sort of loans (safe or risky – whichever you like). One is funded almost entirely by capital, while the other is funded almost entirely by depositors, or other types of debt. The risk run by the funders of each bank is EXACTLY THE SAME. Ergo the cost of funding the two banks will be exactly the same. Ergo having banks or “lending entities” funded entirely by capital, which is what full reserve banking involves, would have no effect on the cost of loans. Where’s the flaw I that argument? The risk by the funders is exactly the same but the return required by them is entirely different. The investor anticipates earning the average yield on his money plus the average spread on the leveraged portion (yield less cost of funds) after deduction of the banks other costs. The depositor believes he is taking no risk and is happy, or at least has no option other than to take the savings rate offered. Quite a big difference and goes to show why banks left to their own devices will leverage themselves exponentially in order to please their investors with increased dividends (and to enhance their bonuses). Your scenario of being totally funded by either equity or deposits is never going to happen for in the fist instance they would not attract investors and in the second they would not attract depositors. “The depositor believes he is taking no risk…”. To be more exact, given taxpayer funded deposit insurance which is what some countries have (including the UK I believe), the depositor doesn’t just “believe” he takes no risk: he ACTUALLY DOESN’T take any risk. However that amounts to a subsidy or a market distortion. So to get at REAL COSTS, that subsidy should be ignored. I.e. one should assume that depositors DO TAKE a risk (or that they fund their own deposit insurance). “…goes to show why banks left to their own devices will leverage themselves exponentially…”. Agreed. Obviously if depositors are subsidised by taxpayers, banks will welcome depositors with open arms. But as I said, to get at REAL COSTS, subsidies should be ignored. Indeed there are other subsidies which induce banks to “lever themselves exponentially”. E.g. given the TBTF subsidy, banks might as well take big risks in the form of high leverage, keep the winnings when all goes well, and send the bill to the taxpayer when it all goes belly up. But there again, that subsidy should be ignored: hence my hypothetical scenario. I should have said that my scenario assumed no subsidies. But anyway, given that assumption, I don’t see why depositors would want a different return to shareholders. Re your final claim that “only funded by shareholders or depositors” banks will never exist, mutual funds are of that nature. E.g. a money market mutual fund accepts deposits, but shareholders are nowhere to be seen. Non guaranteed depositors do not receive an enhanced return so the “subsidy” is not a factor in the deposit rate a depositor is willing to accept. Likewise you conveniently forget that Mutuals have adequate reserves, to support their borrowing and that serve the same function as shareholder funds, without which the Mutual would find no lenders. Lenders to your bank funded only with deposits are assessing the risk of that entity and not of its use of those funds but to recover all their money it will be necessary for that entity to have no risk. My first job was in a bank. Yup. RM doesn’t see to get that. Actually, capital is a ‘liability’ too in the sense that on the balance sheet assets = liabilities + capital. The confusion that RM raises is between capital and funding. Funding = liabilities (borrowings) whereas capital stands apart ready to receive the net proceeds from lending or absorb the losses from defaults. No bank is or ever has been funded by capital precisely because banks are traders in credit, intermediaries between the funders (bank liabilities) and the borrowers (bank assets). What RM describes as a ‘capital-funded bank’ is a bond issue.